These 13" W x 18" H, 4 mil Ziplock Bags provide a clean and simple way to mix water with whatever casting material you prefer. Simply add the appropriate amount of plaster or dental stone and water to the bag, seal the bag, then shake the contents until you have a uniform mixture of casting material. 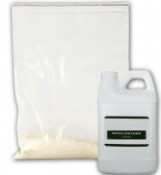 Our empty plastic Water Containers allow you to carry a ready source of clean water for use in mixing casting material.